Lighting experts were brought in to ensure the skies above the forest park were pitch black at night. The organisers of Galloway's bid said they hoped the award would boost tourism in south west Scotland. The final decision on the award was taken at the International Dark Sky Association (IDA) AGM in Phoenix, Arizona, over the weekend. Part of the selection process involved giving a rating via a sky quality meter, which measures the darkness of the sky overhead. The higher the sky quality meter reading the better the conditions for viewing stars, with the darkest reading, such as would be recorded in a photographer's dark room, rated 24. In major cities such as Glasgow or Edinburgh, a likely reading would be about 15 or 16 on the scale. 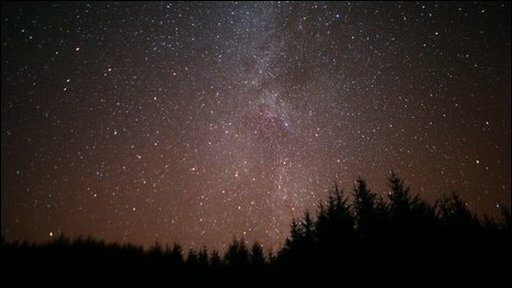 Galloway Forest Park was rated 23 on the scale, giving it a gold tier Dark Sky Park award status - the highest achievable. 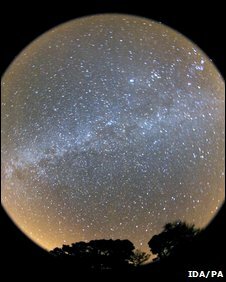 Martin Morgan-Taylor, UK board member for the International Dark Sky Association, said: "Galloway Forest Park is a fantastic asset in the now international network of Dark Sky Parks. "A core aim in creating such a park is to identify and honour protected public lands with exceptional commitment to, and success in implementing, the ideals of dark sky restoration and preservation. "Its location is ideally situated for access from Edinburgh, Glasgow, Belfast and northern England meaning that many people, including children, may have access to a quality night sky, both now and in generations to come. "Such skies are rapidly disappearing and less than 10% of people in the UK can now see the Milky Way from where they live." Keith Muir, Forestry Commission Scotland's head of tourism and recreation in Galloway, said: "We have boldly gone where no-one in the UK has gone before. "Tourism is the single largest economic development opportunity for south west Scotland. "Currently, the Galloway Forest Park welcomes around 850,000 visitors each year and we have big plans to double this over time. This award, the first of its kind in the United Kingdom, should be seen as a universal achievement." Environment Minister Roseanna Cunningham said the worldwide interest in the Dark Skies initiative would put the forest park "firmly in the spotlight". Galloway Forest Park, which was established in 1947, is the largest of its kind in the UK. It covers some 300 square miles (about 77,700 hectares), and is managed by Forestry Commission Scotland. The limited numbers of buildings within the forest park's boundary allows light pollution to be kept to a minimum. Do you have pictures of the sky taken from this park? Send them to the BBC news website. Click hereto send an email. If you want to send your picture from your mobile phone, email them to newsonlinescotland@bbc.co.uk. You can send them from any network or phone. Please send the large full size images (usually 640x480 pixels) taken by the mobiles otherwise they are too small to publish. Please ensure when filming or photographing an incident that you make your safety and the safety of others a priority. It's important to note, however, that you still own the copyright to everything you contribute to BBC News Online. This means you are perfectly free to take what you have produced and re-publish it somewhere else. Please note that if your image is accepted, we will publish your name alongside it on the BBC News website. The BBC cannot guarantee that all pictures will be published and we reserve the right to edit your comments.